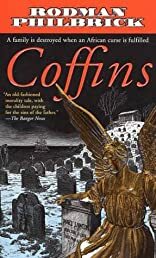 Physician Davis Bentwood, making a lengthy housecall at the Coffin family mansion on the coast of Maine, finds the newborn grandson of Captain Cash Coffin, stiff and cold as a block of ice, in a cradle not ten feet from a roaring fire. Young Davis can find no medical explanation for the baby's death. After a mysterious accident at the family shipyard caused the simultaneous death of his twin sons, Cash Coffin locked himself in study, and threatened to shoot anyone who approached. Cash's youngest son, the dwarf Jebediah, has asked his old friend Davis to try to help the old man. Another Coffin son, an experienced ship's master, dies at sea in a freak accident that defies a natural explanation. And on a moonless night, Davis Bentwood is awakened by an eerie light that leads him to the Coffin family's darkest secret. Cash Coffin traded in slaves. Davis Bentwood's blood-chilling discovery holds the key to the family's destruction. Can the ancient evil being visited upon the Coffins be stopped?